A number of years ago, in conversation with a Christian friend, I mentioned Paul’s Letter to the Romans. “I don’t know it,” she responded. I suppose I shouldn’t have been all that surprised, since the Letter to the Romans is not an easy part of the Bible to get through and understand—which is why very few Christians even give it a try. The gospels have far more appeal and get a lot more traffic. But still, such ignorance of basic Bible material surely isn’t a good thing for believers who aspire to be—or even assume they are—Bible-based Christians. No matter the indifference of laypeople to the Letter to the Romans, it is a source of bewilderment to secular thinkers that Christian theologians have been obsessed—and I do mean utterly obsessed—with the Letter to the Romans, for centuries. Those of the Protectant persuasion might be aware that Martin Luther urged Christians to memorize it, but I suspect that ordinary folks in the pews would be dumbfounded to learn that every syllable, word and verse of Romans—every jot and tittle—has been scrutinized and analyzed, over-analyzed, super-analyzed, painstakingly, exhaustively, by Christian theologians. They tease out, squeeze out the tiniest bits of revelation that might have sparked from Paul’s mind onto the scroll…as if the fate of the Cosmos were hanging in the balance. But I guess, of course, for those in the Christian cult, that’s what Romans is about. But, of course, it’s not. Because Paul was a crank. In my book I argue that he was a ‘delusional cult fanatic’—but ‘crank’ is good shorthand. He was the prototype for Christian crazies who have shown up repeatedly in the centuries of the Christian era. How so? I mean, really, how can anyone take this guy seriously? (1) Paul assured one of his congregations that, when the Lord came back, their dead relatives would pop out of their graves to meet Jesus in the clouds—with musical accompaniment, no less (I Thess. 4:16-18). (2) Paul scolded Christians for taking one another to court; didn’t they know they were qualified to settle their disputes? Why? Because one day soon they would be judging angels—after Jesus’ return (I Corinthians 6:3). (4) Paul had no interest in good government (or in art, culture or education, or that matter).He assured his readers—this is in Romans 13—that all leaders are in power because God put them there. (5) He embraced a magic formula for eternal life that sounds straight out of Hogwarts: “…if you confess with your lips that Jesus is Lord and believe in your heart that God raised him from the dead, you will be saved” (Romans 10:9). This is just a start, but I rest my case: Paul was a Jesus groupie and nothing else. Randel Helms (Gospels Fictions, The Bible Against Itself) has said that the Bible is self-destructive artifact, and the Letter to the Romans is Exhibit A in making the case that this is so. It has land mines in almost every chapter. Christians can see theology exploding in their faces if they venture to step through these chapters, unaccompanied by apologists. During the coming weeks—spilling over into January, I suspect—I will offer a few reflections on each of the sixteen chapters in Romans. I will make the case that this over-adored epistle is indeed a toxic brew of bad theology. Ben Witherington, by the way, undermines any confidence that Romans is revelation, when he warns his readers on page one of his 400-page work, “…the goal of understanding this formidable discourse is not reached for a considerable period of time.” So God planned it that way? Why would we have to work so hard to grasp revealed information? Did you get my hint of ridicule when I mentioned Douglas Moo’s huge tome above? Yes, I am baffled by his efforts. Lest I be accused of anti-intellectualism, however, in scoffing at a 1,000-page book on Romans, let me say that, of course, academicians who specialize in antiquities are justified in pursuing their passions. Our heritage is enriched because there are countless weighty tomes about the works of Solon and Homer, about the hieroglyphed walls in Egypt and the pornographic murals in Pompeii. The authors were motivated to understand human genius and creativity, to increase our quotient of enlightenment. 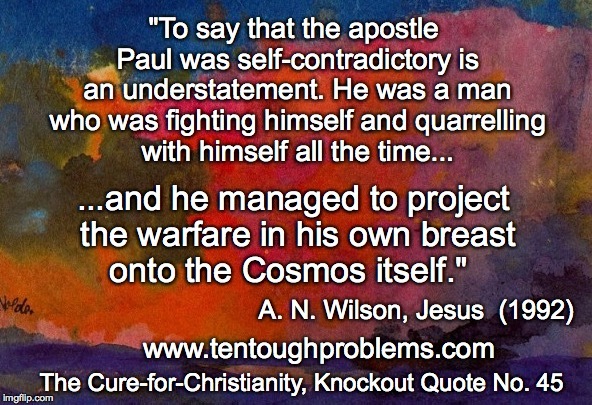 But the motivation for obsessive study of Paul is to figure out a god. The scholars who do this are on a holy mission. 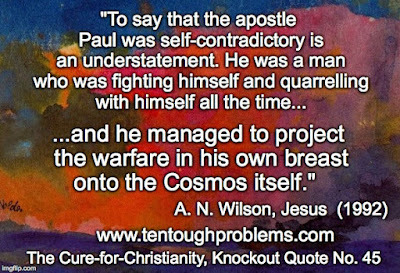 Sadly—can’t they admit it?—Paul was not channeling a god in his hallucinations. He was an obsessive-compulsive mediocre thinker and bad theologian. He churned out reams of theobabble, which, by an accident of history, were elevated to the status of scripture. The academicians who study Paul are determined to distill the essence of God’s will, to discover the divine mind. They are on fool’s errand. Their pursuit is as worthwhile as studying the minutia of old letters written by medieval astrologers or alchemists. The Letter to the Romans deserves to be at the bottom of the scrapheap of history. Paul is an embarrassment. David Madison was in the Methodist ministry in Massachusetts for nine years. He has a PhD in Biblical Studies from Boston University, and is the author of Ten Tough Problems in Christian Thought and Belief: a Minister-Turned-Atheist Shows Why You Should Ditch the Faith (Tellectual Press).